South Texas in early April and the rut was on, hard. Does were almost always seen running, only stopping to look back over their shoulders for a moment before…running some more. 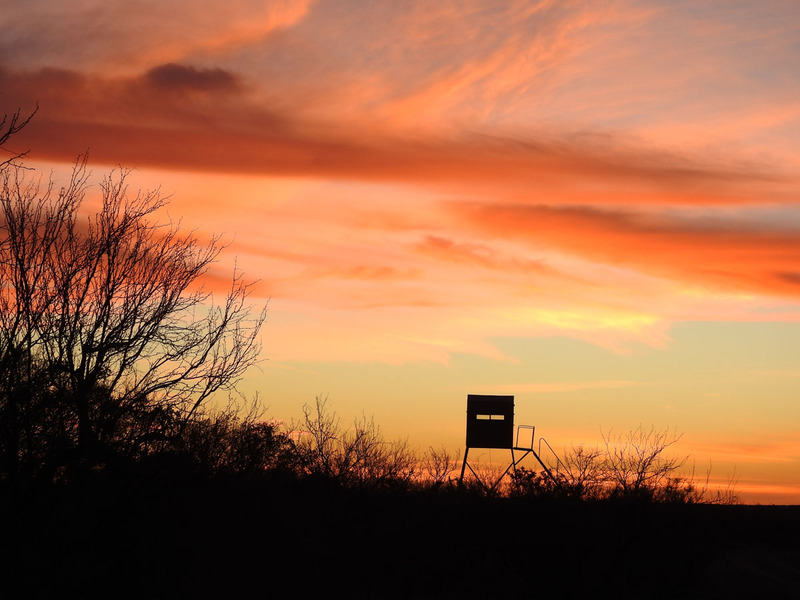 If you saw a buck, he was either dashing across an opening at full speed, trailing a doe or poking his head out of the mesquite for just a second before disappearing. White-tails rutting April? No. 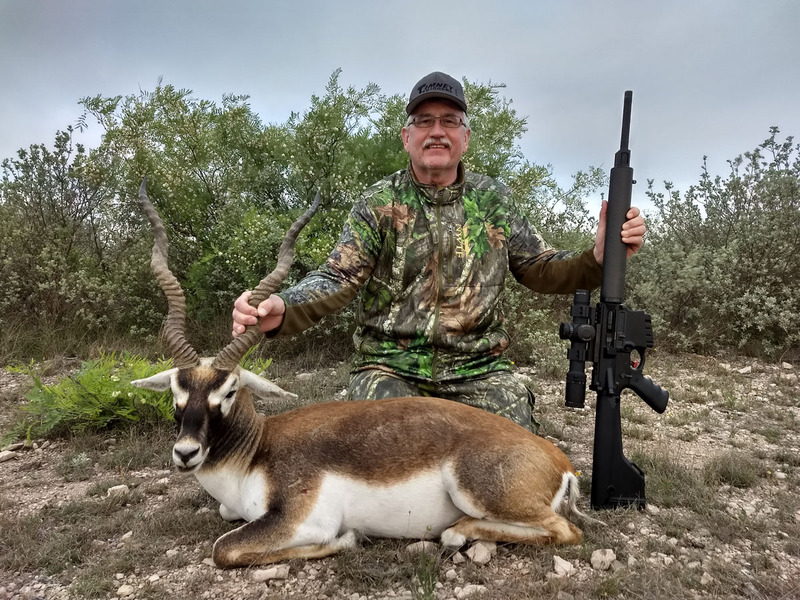 The running and gunning were done by exotic blackbuck antelope, on a ranch near Del Rio, Texas, and just 30 miles from the border with Mexico. A native of India, Nepal, and Pakistan, the blackbuck roams the wide-open spaces of Texas, too. Anytime I mention hunting Texas exotics, especially on social media, several people feel compelled to tell me they would never ever hunt a high-fence facility. They usually question my ethics as a hunter, too. To which I respond: a) high fence hunting is legal and enjoyed by many, so quit trying to shame others into your definition of hunting; and b) actually, my Texas hunts are for free-range exotics. Many people don’t realize it, but Texas is home to tens of thousands of free-ranging aoudads, Axis deer, blackbuck antelope, fallow deer, and nilgai, among others, none of which originated on the North American Continent much less the Republic of Texas. Most of these animals were imported during the 20th Century, often to be raised inside fences, some for the purpose of hunting, others for the pleasure of having these strange and wonderful-looking animals around. But fences being what they are, and ranching is a hard way to make a living, many fences came down and a good number of ranches went bust. The various exotics got out and did very well among large swaths of the Texas countryside. The blackbuck is a native of India, Nepal, and Pakistan. Males sport ringed, twisting antlers, white markings around the eyes and a two-tone body color that ranges from black-and-white to brown-and-white. They’re smaller than whitetails, with males usually only getting to 100 pounds or so. Actually, my plan was to take an Axis deer, another favorite of hunters. I’d taken two Axis on past Texas hunts and they are great-looking animals, with venison that’s superior to most game meat including (in my opinion) elk. Axis stags are instantly recognizable by their spotted coats and tall, branching antlers. They’re originally from the Indian sub-continent. Stags can weigh in over 200 pounds, and the aggressive Axis is known to be pushing out native whitetails in parts of Texas. 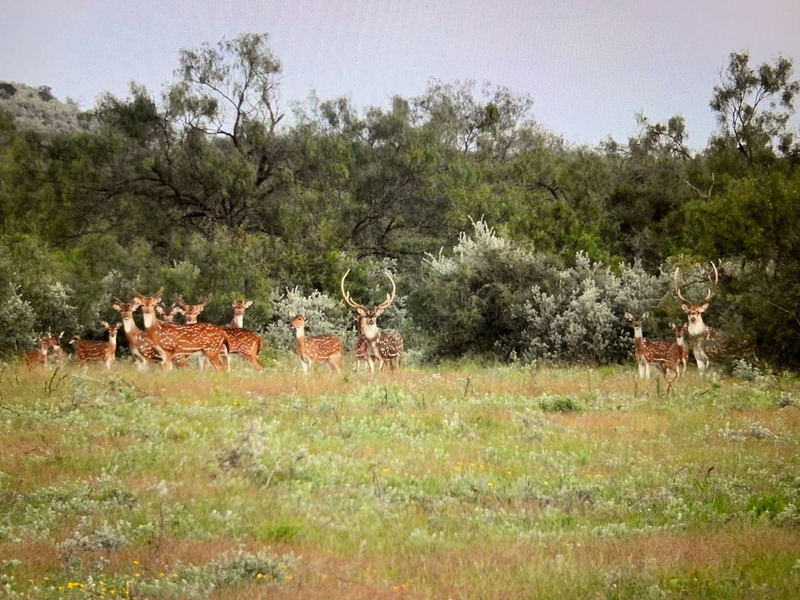 A family group of Axis deer, another imported exotic providing free-range hunting throughout much of South Texas. This April hunt was at the invitation of Timney Triggers. I brought along one of my favorite hunting ARs, the DPMS .260 GII Hunter, chambered in the often-ignored .260 Remington cartridge. For the hunter using factory ammunition, the .260 Rem has nearly identical ballistics to the wildly popular 6.5 Creedmoor out to 500 yards. I used the Barnes VOR-TX .260 Rem ammunition, firing a 120-grain TSX all-copper bullet; the rifle was topped with one of my favorite hunting scopes, the Trijicon AccuPower 1-8×28 scope. 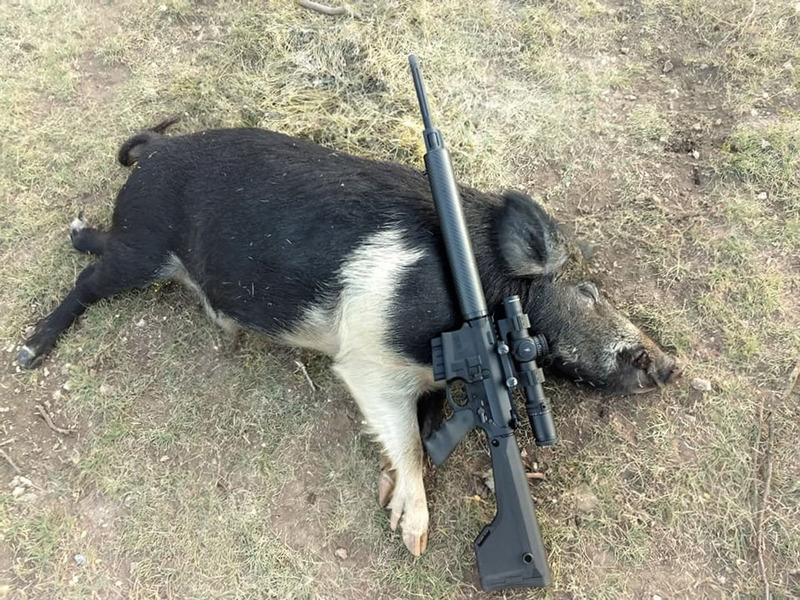 The DPMS .260 GII Hunter with a Texas hog the author took using the rifle. 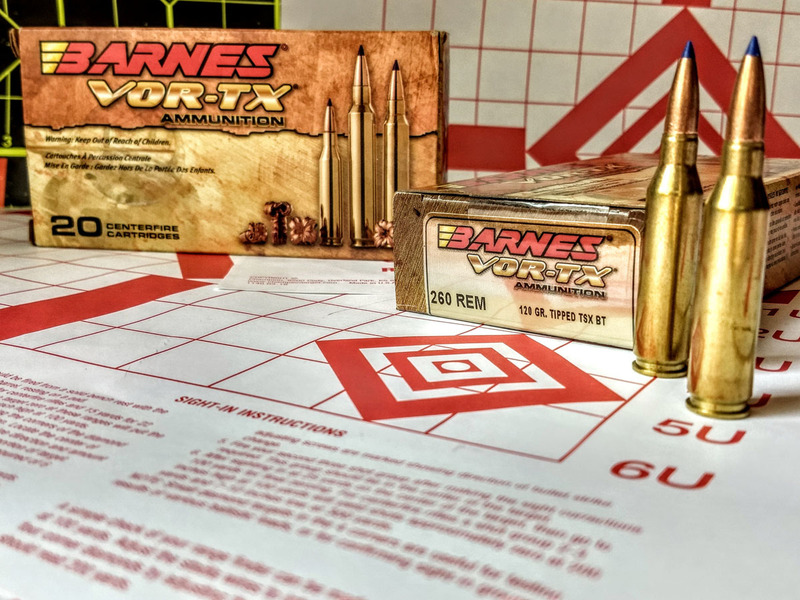 Often overlooked, the .260 Rem has nearly identical ballistics to the wildly popular 6.5 Creedmoor, out to 500 yards with factory hunting ammunition. One of the author’s favorite hunting scopes, the Trijicon AccuPower 1-8x28mm. I’d also replaced the trigger on the DPMS .260 Hunter with one from Timney Triggers: The AR Calvin Elite Replacement Trigger. A single-stage trigger, the AR Calvin Elite was easily switched out with the original trigger. 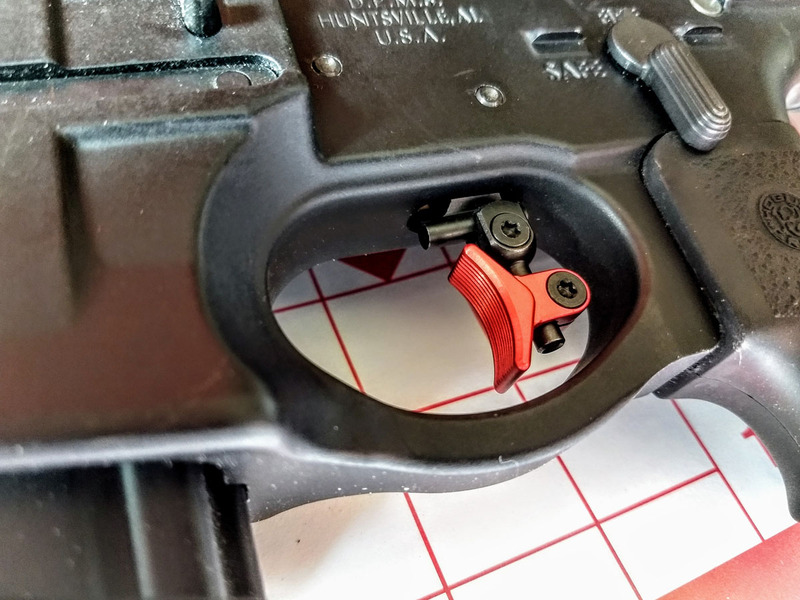 The AR Calvin Elite Replacement Trigger from Timney Triggers fits most AR-style rifles and is easily installed. The original DPMS trigger was a pretty good one. I’d taken white-tailed deer and hogs with the rifle and original trigger, all single shot efforts that stopped the animals fast and hard. At the range, the rifle pegged MOA groups. But until I’d replaced the original triggers on several rifles with Timney’s, I didn’t realize what a difference a higher-quality trigger could make. 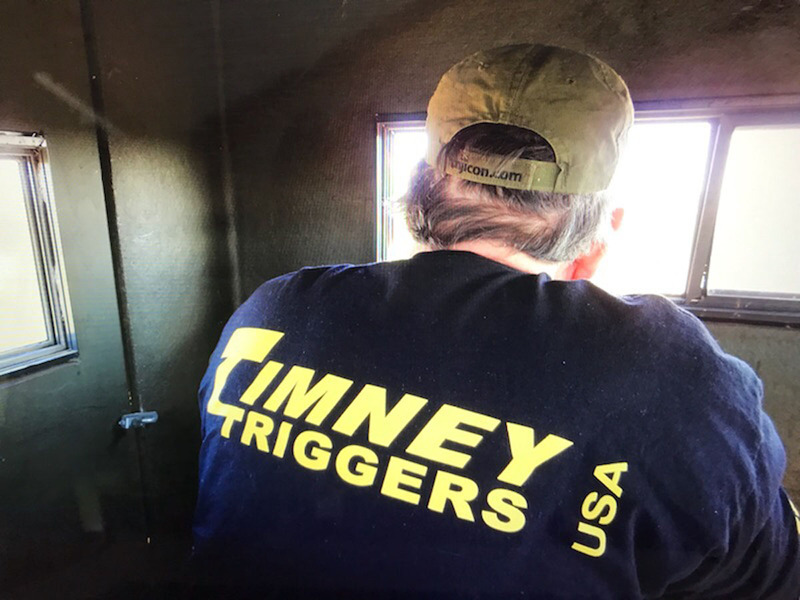 Timney triggers break very, very cleanly, and I’ve never had a stiff trigger on a Timney that could pull a shot. In the DPMS and other rifles I’ve done the Timney replacement, my three and five-shot groups have tightened up a half-inch on average. The AR Calvin Elite Replacement Trigger installed in the author’s DMPS .260 Hunter. That half-inch doesn’t really matter at 100 yards on deer sized game. But I like a hunting rifle that can reach out a good 400 yards when needed, and as the distances grow, the Timney’s have always proved their worth. The AR Calvin Elite breaks right around one-pound, with no creep. Squeeze, and the bullet is leaving the barrel. 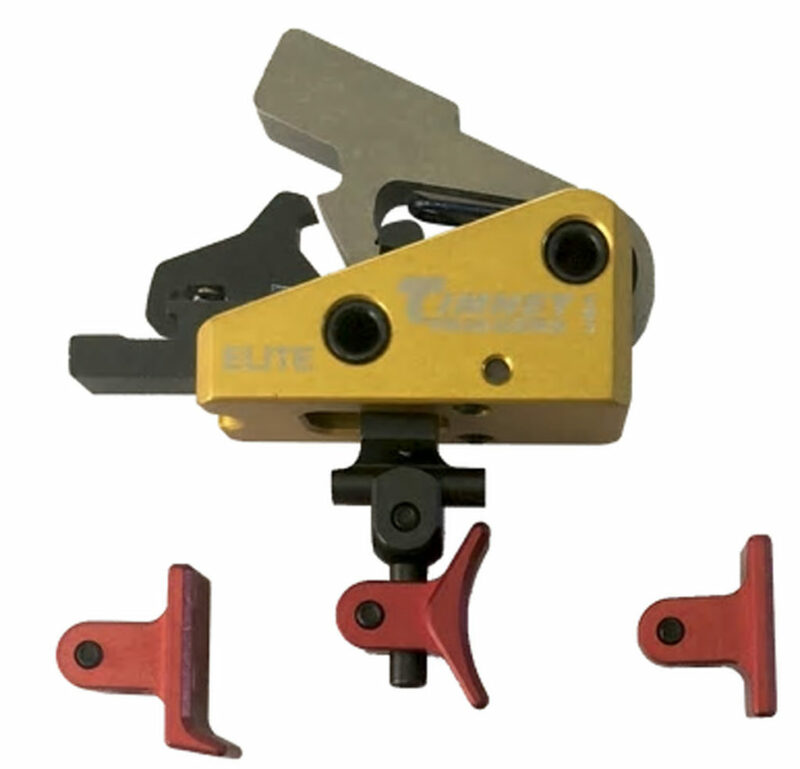 The AR Calvin Elite comes with three different trigger shoes; the shoes are adjustable for length of pull, cast, and height. You can truly customize the trigger’s fit to your shooting style. I was hunting a working livestock ranch which raised mostly sheep, with a few small herds of cattle. The landscape was very diverse, from rocky, cactus-strewn hills to mesquite flats, and thick tangles of prickly brush. Low fences surrounded the property, the four-foot variety easily vaulted by whitetails, Axis and blackbuck but which kept in the livestock. 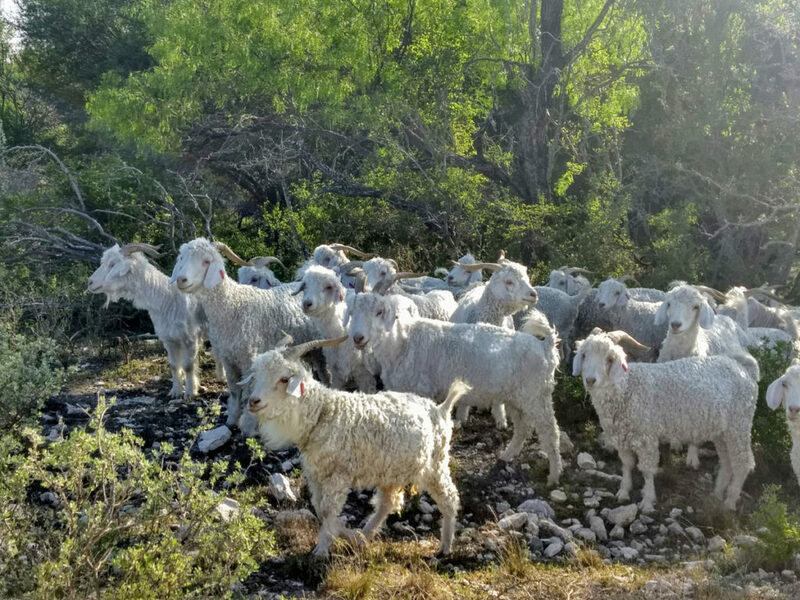 The hunt was held on a working livestock ranch, home to hundreds of goats. When I got to the ranch, on that first late-afternoon drive with Coker, we spotted a small Axis buck and two does. I figured I’d be bringing home some delicious Axis meat. I spent the first two days of my hunt trying to spot an Axis buck. 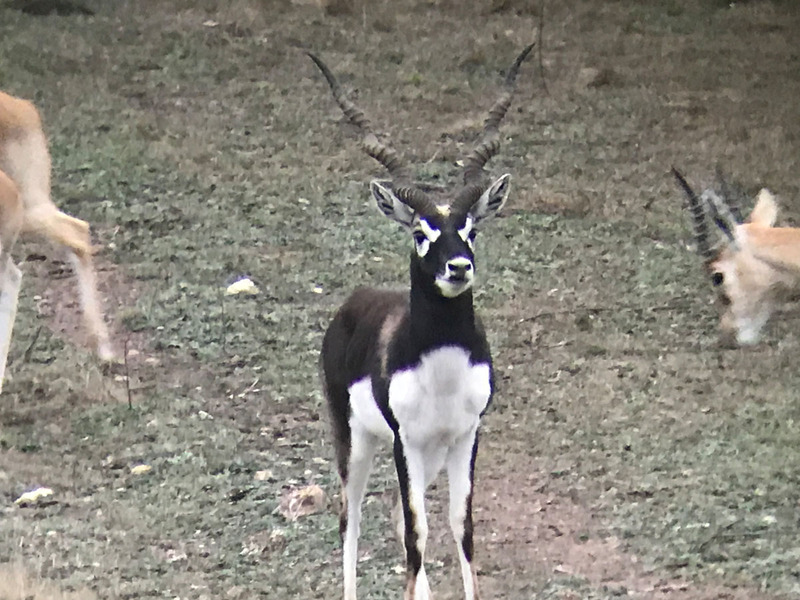 What we saw, though were dozens upon dozens of white-tails; when we drove from ranch house to hunting stands and back, we usually spied several blackbuck does and bucks running through the brush. 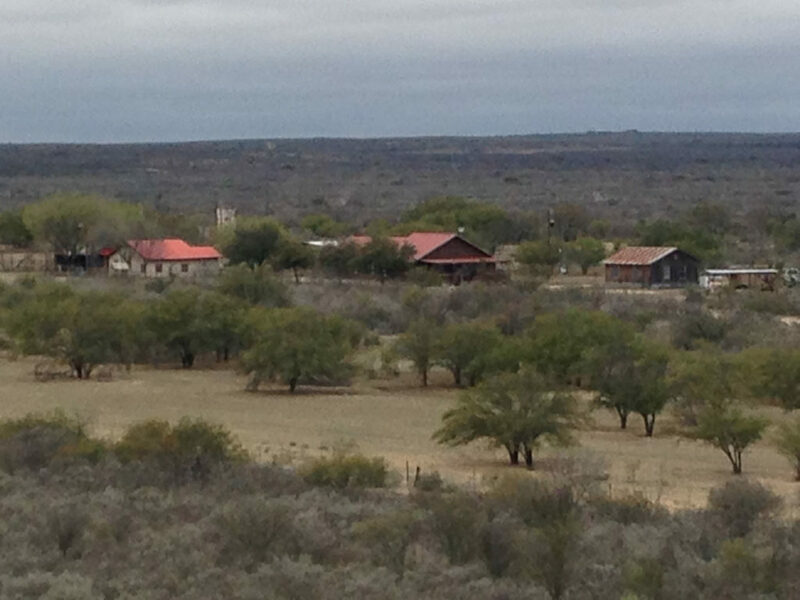 The South Texas ranch house/hunting lodge and outbuildings. Coker’s “place” was a gas pipeline right-of-way, a 100-yard-wide corridor cut through the thick Texas underbrush. An elevated blind was set up mid-point on this section of the cut, with the land rising to my right and gently falling to our left. Coker and I had passed this cut many times on our drives, at the far, left end where a ranch road formed a “T.” More times than not, we saw several blackbuck males and females out in the short grasses. Of course, we didn’t see a single blackbuck that first morning when I was looking for one. The author scanning for a sight of a blackbuck. Unsuccessfully. The afternoon got off to a promising start when a blackbuck doe appeared down the gas line cut about 400 yards away and started jogging towards us. I adjusted my chair and rested my DPMS on the window ledge. The doe stopped to eat some grass, and after a few minutes laid down. Coker and I glassed the brush on either side of her, anticipating a buck. But that never happened. As the sun cast late afternoon shadows, two large flocks of Rio Grande turkeys appeared, clucking and squawking as they worked the soil with their beaks for insects and seeds. One flock came within 25 yards of us. I had a turkey tag, but my shotgun was sitting at the ranch house. More good luck, I thought. Day the Last, and I had an afternoon flight leaving out of San Antonio, a two-hour drive away. I had to be on the road by noon. “Where do you want to try?” Coker asked me at breakfast. “Let’s go back to the gas line,” I said. We got into the stand before dawn, waited for the sun, and saw movement right away. My heart started thumping–until I realized the movement was a dozen whitetails drifting onto the gas line to graze. “Bring your checkbook,” was all he said. From the blackbuck hunting stand in the early morning. After an hour, a blackbuck doe popped out of the mesquite, upslope from us and a few hundred yards away. She trotted to the middle of the pipeline cut, halted and glanced behind her. The male blackbuck peeked out his head from the brush where his lady had appeared, looked around and then dashed over to her. Through his binoculars, Coker ID-ed him as a definite shooter: mature, at least five-years-old, and with antlers in the 20-inch range which, for blackbucks, is trophy territory. My rangefinder put him at 380 yards. Right on cue, the doe began walking in our direction, then picked up speed, trotted a hundred yards and stopped to nibble some grass. The buck stood still, facing in our direction, watching her. And then…he ran. Ran straight for the brush on the other side of the pipeline as fast as he could and disappeared into the mesquite. All of which took about two seconds. I looked at Coker. Eyes wide, all he could do was a shrug. The doe continued to make her way toward us, stopping to eat grasses, in no hurry at all. With my binoculars, I kept scanning the spot where the buck had vanished. It was after 9 AM, the hunt looking like a bust when the blackbuck male suddenly appeared way upslope. I moved my DPMS onto the window ledge. At this point, the blackbuck doe was maybe 100 yards from our stand and among a group of white-tailed does. The male trotted towards his lady, head up, looking straight ahead. I had the Trijicon’s reticle on his narrow chest, and when he got to 200 yards was thinking about taking the shot. But every time he paused, the blackbuck put his nose to the ground. The only shot was the back of his neck. Then I got an assist—from a clump of scrubby mesquite. As he came closer, the blackbuck moved around that clump of brush and in doing so turned broadside to me at 140 yards. I already had him in my scope, and when he paused to check on his doe, my finger eased back on the Timney trigger. I heard the shot through my earplugs, lost the blackbuck for a moment as the recoil made the scope jump. The buck had toppled over right where he stood, the Barnes TSX bullet having smashed through the top half of his heart. The author’s first blackbuck, with antlers approaching 20-inches. I let out a breath, took in several more, and checked the time on my cell phone. 9:33 AM. I’d finished my hunt with a whole 27 minutes to spare. “You didn’t think it was going to happen, did you?” said Coker. That was one of us, I wanted to say. I unloaded my rifle, said a small prayer of thanks, and headed out of the stand to see my first ever blackbuck. About the author: Brian McCombie writes about hunting and firearms, people and places, for a variety of publications including American Hunter, Shooting Illustrated, and SHOT Business. He loves hog hunting, 1911’s chambered in 10MM and .45 ACP, and the Chicago Bears. Next post: Turkey Hunting: What’s In Your Pack?